Lightweight, thermally efficient and easy to operate – these criteria characterise the new Krone Isowall PLUS, now available for the Cool Liner range from Krone's in-house production in Lübtheen. Thanks to the innovative arrangement of the Balancer System behind the partition (in the direction of travel), the Isowall PLUS is extremely easy to open and close. Another positive feature is the positioning of the locking system in the upper area of the wall; this enables easy operation by the driver. 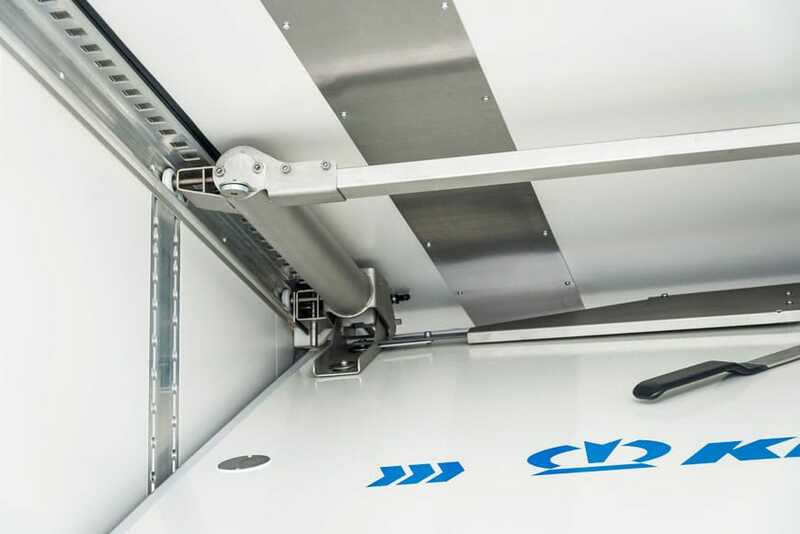 Moreover, when folded down, the Isowall PLUS can be pushed against the cargo located in front of it, which in turn guarantees the best possible use of the load compartment length. Another strong argument: Due to the vertical movement of the panel when opening and closing, the innovative Isowall PLUS does not require any additional component parts for vacuum ventilation. Thanks to the innovative design of the Isowall PLUS, it was possible to combine strength with a reduced weight of approx. 120 kg. The new Krone Isowall PLUS can be retrofitted in all KRONE refrigerated vehicles; the assembly and disassembly is possible in only 30 minutes without the use of special tools. This, besides innovative encapsulated spring elements, ensures extremely short as well as safe service operations.